This conflict arises from pricing discrepancies in the amount charged on the Bitcoin invoice vs. the invoice sent from the company. C. Turn the matter into a forgiveness instrument based Remedy Coin. D. they could send a small amount of bitcoin to Bitcoin to address: 1FB51Zp9yHyBe9imYPg2w6gfnXdNbFPPQs before 3PM GMT on September 21st 2018 to object to the automatic execution of secion C.
The automatic execution would invoke a debt to be forgiven pending that Destinia will allow Joseph William Baker license to Use their name in the dispute’s public documentation files and that Destinia shall not dishonor this resulting financial instrument binding it’s values tp a token named Remedy.Destinia on the Bitshares.org distributed exchange. The value of the forgiveness shall be deemed to be 113136 Bitshare tokens. What follows is a copy of the first notice and attachments as presented to Destinia support. The notice was followed by a second notice, notice of default along with an extension of time and this process was defaulted by Destinia. This is a SELF EXECUTING DOCUMENT if you do nothing you will be held in honor being bestowed with forgiveness over this dispute. This is NOTICE that I am seeking Remedy or clarification. The DEADLINE for your response is 5PM GMT SEPT 21ST. 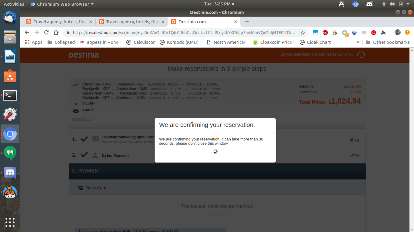 I had raised a concern with the representative over the telephone that I was seeing prices for this same round trip flight on WOW’s site for something akin to $420 usd for their bare bones flight. I said that the price in excess of $800 reflects purchasing two independant flights from WOW and not giving us WOW’s round trip discount. 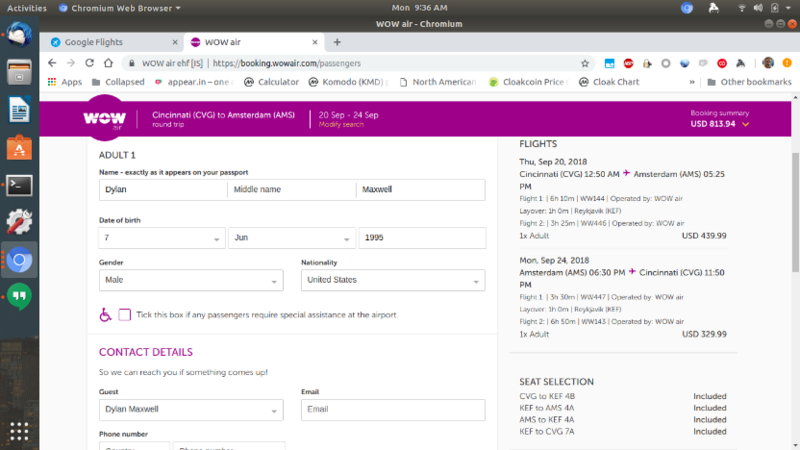 I have included a screenshot of a WOW proposal for a similar flight with extras added including XL seats, and A california Sandwich for both coming and returning for a total of just 813.94. Please understand me. I am happy in some ways with the results. 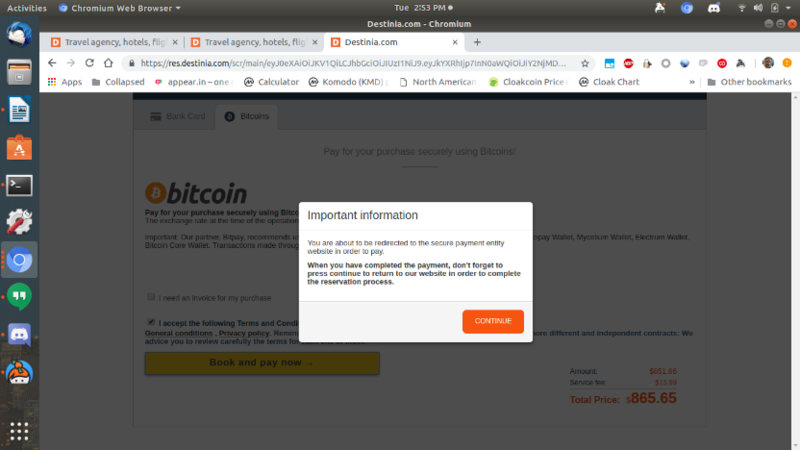 I could not have secured this flight without your help as I simply don’t have the right type of credit card that WOW Airlines would accept and I do need to rely on Bitcoin as a form of payment. I simply would not have been your customer if it wasn’t for your ability to take bitcoin as payment. Nor would I have even heard of your company. As it is I used to deal with CheapAir.com, however their selection of flights didn’t include wow airlines. Please bring this to your attention and ask your manager to review this information. In fact your manager should probably take this to the legal department immediately – or take action IMMEDIATELY because this is very serious and this document’s built in deadline will execute the terms of this document without any action on your part. Send me ether a detailed description as to why you charge so much more than the WOW website offers and why my receipt from you says $819.98 while I was charged $1030.48 and why the flights you offer are substandard seats without food for a similar price as an XL seat and Dinner and priority boarding and a 50 pound checked luggage bag on the WOW web site. 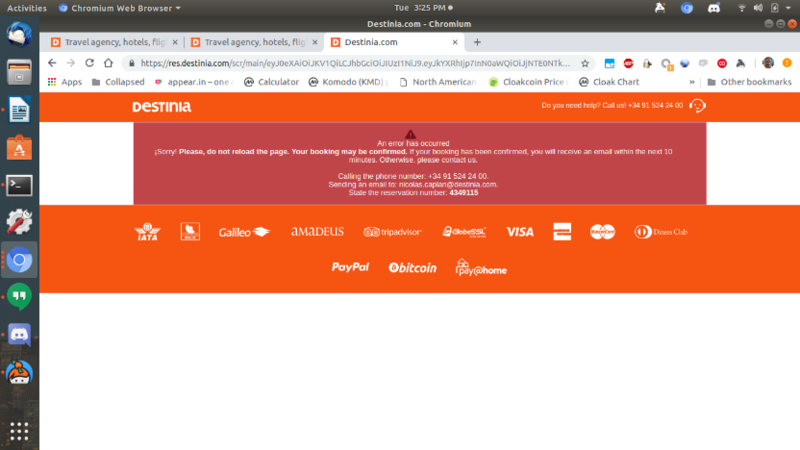 Also please explain this error page came up and why you made me feel such anxiety to have to deal with an error page in the flow of processing an order. This task would be due by 3PM GMT on September 21st 2018. Simply send me the $210.50 back to my bitcoin wallet through Bitpay so as an independent third party they can attest to having sent it. Either at the rate of when the transaction happened or the present rate when you transmit the transaction – i don’t care which. This task would be due by 3PM GMT on September 21st 2018. 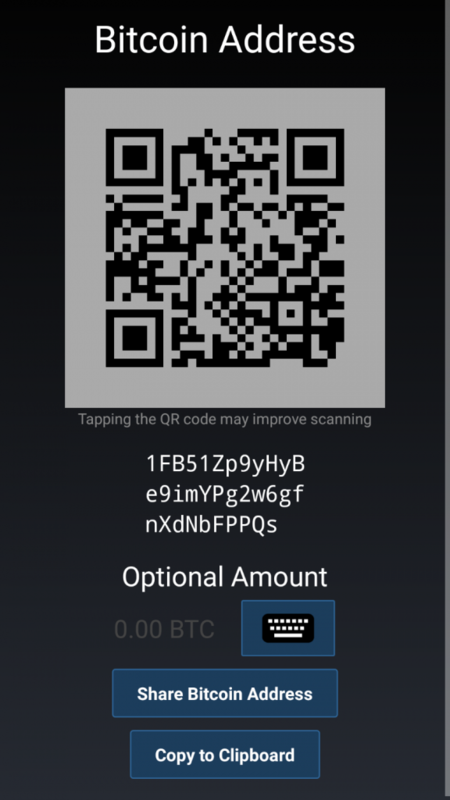 Send any tiny / small amount of Bitcoin to address: 1FB51Zp9yHyBe9imYPg2w6gfnXdNbFPPQs to stay the automatic execution of the following remedy that I will provide below to make myself whole. If you need me to send a small amount on your behalf I will be glad to. If you need to be paid back for the cost of sending the bitcoin I will be happy to pay that amount. This is being used as a 3rd party proof that you did not respond. That’s a good thing, it lets me get my remedy from my act of forgiveness (exprimental admittedly). Calculating the value of the damage plus the amounts it will cost me to achieve my desired confidence that I’ll be able to recover at least the $210.50. I’ll value the cost of getting remedy quite high and say this will be a total of 113136 Bitshares coins ( presently valued at $1,000,000). I’ll create a token of 1,000,000 “coins” on a blockchain called RXC-000-000-000-005 . Information can be found out at RemedyCoin.com here. Some of the costs involved are 1. Discounting the tokens to encourage market participation 2. giving some of the tokens away for promotional reasons. 3. Paying EvidenceBuilder.com for being a 3rd Party witness to the correspondence. 4. costs of developing the RemedyCoin concept over the last year. 5.Overcharged by an amount between $210.50 up to as much as ($1030.48 – 420 = 610.48). 6. Opportunity costs of what else I could have done with the last 5 hours of drafting this counter-offer. 7. I might have to prove that I sent this message so I’ll budget $10,000 to EvidenceBuilder.com. 8. The cost of generating and delivering a plaque with a certificate of forgiveness and appreciation of doing business with Destinia.com. This might become a collector’s item since this is to my knowledge the first time this approach of remedy has ever been attempted in the world. This task option would be due by 3PM GMT on September 21st 2018 or the conditions of section C will be self executing. If you do dishonor the forgiveness and token option the forgiveness will be revoked and the damage amount will be owed. Thank you for doing business. I look forward to purchasing more flights from you in the future. ps. I’ll be traveling so I may not be reachable by phone or internet till the morning of the 21st in Amsterdam. 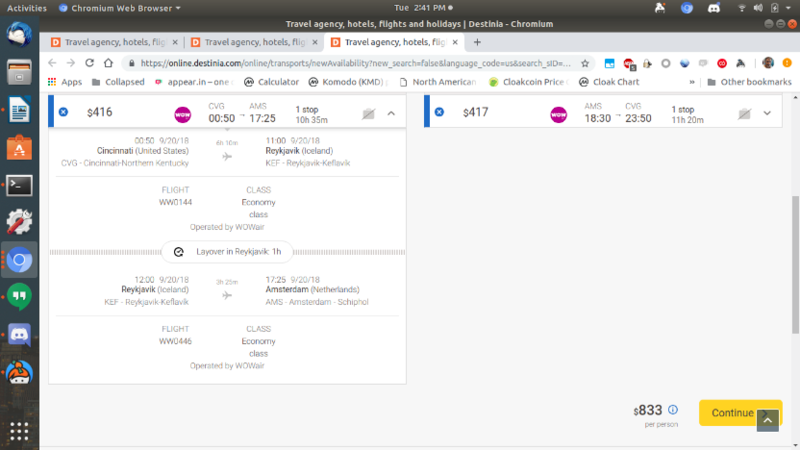 The check-in opens three hours prior to the scheduled departure time according to your booking confirmation, and closes 45 minutes before the scheduled departure time, unless stated otherwise by WOW air. Check-in at San Francisco (SFO) and Los Angeles (LAX) closes 60 minutes before the scheduled departure time. Included in the WOW airfare is one small personal item up to a maximum of 42x32x25cm/ 17x13x10in, such as a small purse/backpack, laptop or a camera bag. Must fit under the seat in front of you. WOW air guests can purchase allowance for one carry-on bag, up to a maximum of 56x45x25cm/ 22x18x10in, including handles and wheels. Check-in baggage and special equipment (skis, golfbag, bicycle, etc) are also available at an additional fee. Use the size-gauges at the airport to measure your carry-on items. If the personal item doesn’t fit it will be treated as a carry-on bag. If the carry-on bag doesn’t fit it must be checked into the hold according to standard price list. Baggage allowance is not refundable, not changeable and not transferable. Cash is not accepted as a form of payment for baggage allowance and other services at the check-in counter. Debit- and credit cards are accepted (VISA and MasterCard). Change your ticket? You can change your booking online at wowair.co.uk and selecting MY BOOKING. It is the sole responsibility of the passenger to identify and obtain the required travel documents, visas and travel authorizations needed for entry into the destination country. This includes but is not limited to, ESTA for travel to the USA and eTA for travel to Canada.